St. Mary’s Church - Caspar David Friedrich | Since 1774. In Greifswald. 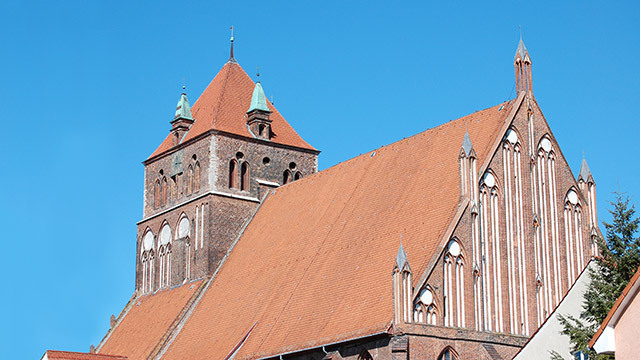 Just like the two other old parish churches, the Brick Gothic church St. Mary’s shapes the skyline of Greifswald and features in Caspar David Friedrich’s painting ‘Meadows near Greifswald’ (1820/22, Hamburger Kunsthalle). In addition, Friedrich had a special connection to this church at the beginning of the 19th century. Since the early 1790s, the dilapidated altar of St. Mary’s church in Greifswald was awaiting restoration. In 1797, Johann Gottfried Quistorp drew up a first draft; however, action only followed in 1802, when parts of the Renaissance altar collapsed during a church service. Quistorp, who was entrusted with the altar project, wanted to involve the young and so far unknown Philipp Otto Runge, who was experimenting with religious paintings such as ‘Rest on the Flight to Egypt’ in the years 1805/06. However, the imminent war brought all plans to a halt, until the interior, which had been badly damaged during the French occupation, was in urgent need of repair in 1810. Quistorp and Johann Friedrich Droysen, Professor of Mathematics and Astronomy, were asked to submit drafts for a new altar. Droysen wanted to ask Runge for the inclusion of his paintings. However, in 1811, the project stalled again, until Droysen submitted a proposal, which Runge himself had made before his untimely death from tuberculosis in December 1810: To buy Friedrich August von Klinkowström’s copy of Antonio Correggio’s painting ‘The Holy Night’, owned by the Runge family. That very year, the ‘reasonably priced’ painting was purchased for the altar. It is to be assumed that Caspar David Friedrich, who was also friends with Klinkowström and living in Dresden at the time, had heard about the acquisition of the painting for his native town Greifswald. When Friedrich visited Greifswald in 1815, he was asked to attend an on-site inspection at St. Mary’s Church in order to state his views in front of the District Administrator and the Mayor, Mr Meyer. Friedrich was vehemently opposed to an altar painting due to the shortness of the nave and presented a sketch of his own idea. The Senate asked for a full draft and entrusted Friedrich with the supervision of the construction works. However, when Friedrich submitted his proposal it was rejected on cost grounds. But there was probably more to the rejection than financial reasons. When Friedrich attended the on-site inspection and during the subsequent negotiations concerning the construction of the altar, his self-confident and assertive manner had apparently vexed Mr Meyer, one of the most powerful citizens of Greifswald. So after years of constant toing and froing, it was Johann Gottlieb Giese, former student of Quistorp, who finally mounted Klinkowström’s painting on the retable of the altar. Apart from the retable with Klinkowström’s painting, the choir interior was also fitted with a ceiling consisting of a lattice-like framework of bars and tracery. The inner altar zone, standing on a podium, was fitted with a balustrade. The reconstruction of the choir and the altar of St. Mary’s Church was officially finalised on 1 April 1837 and has remained virtually unchanged to the present day.